I think we can all admit to gazing at the page of a magazine and thinking - how does her figure look that good? Well, the truth is, it most probably doesn't. At least, not before heavy photo-shopping. These images, that portray such distorted ideas of what 'true beauty' is can have a devastating effect on young women today. You can watch a video that highlights this issue here. 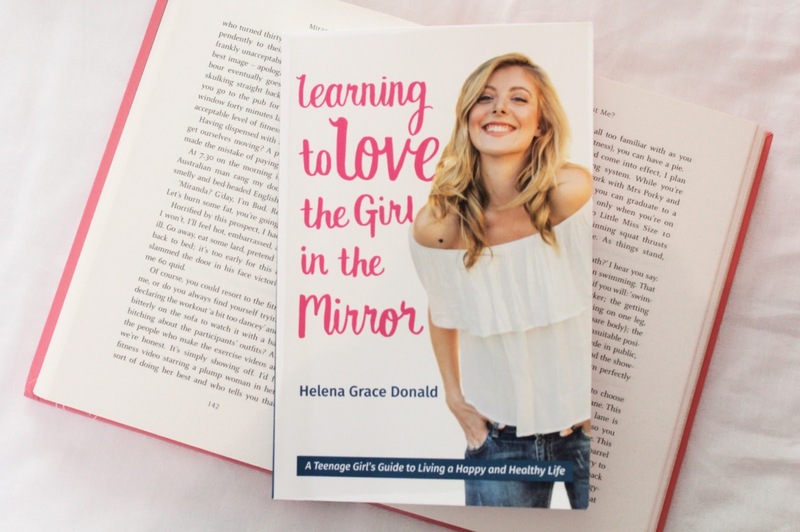 So, when I was asked to read Helena's book "Learning to Love the Girl in the Mirror," I was excited; excited about the fact that someone was addressing these problems, and not only that, but doing something in attempt to solve the consequences they can have on young women. The book is very readable, and therefore appropriate for a range of ages. The font gives the text a friendly nature, and the quotes dotted throughout provide little doses of inspiration. I also liked how the book tackled several problems teenage girls face, not just about their appearances, but other issues, such as stress. Through providing solutions to these problems, the book becomes a guide which can be referred to, which is a lovely. Kind of like an agony aunt, in book form, if you'd like. The fact that Helena speaks from her own experience definitely gives the book a personal touch, making the reader, importantly, feel as though they are not alone in the struggles they are facing in their teen years! First of all, thank you for writing a book with such an important message. What was it that really drove you to write this, was it more your personal experiences, or your realisation of how tough society can be on young women? Wow, what a great question! I think it was actually both! I knew that I would not be staying true to myself if I didn't share this important message with other young girls. It became my mission and my passion to share with other young women that they do not need to feel alone and that there is another way of thinking and feeling that will turn their lives the right way up. That certainly was because of the amazingly healing personal journey that I went through with my own mind and body but I was also driven to share my story because I know how many other girls are out there also feeling this way. Being a teen girl in today's society certainly isn't easy and if I can help any girl to feel less alone and to feel more empowered in her own life, then that just means the world to me. In your book, you speak of overcoming an eating disorder. I have had friends who suffered from this, and have thankfully made a recovery now. Do you think young women having these unhealthy relationships with food has increased recently, or do you think it is an issue that has recently been highlighted more, due to factors such as the internet? Just from my own personal opinion, I do feel like women struggling with unhealthy food relationships and negative body image issues has increased. And statistically, eating disorders are on the rise. That's not to say that women weren't struggling before, but there's more in the media now about it and I think doctors and mental health experts are realizing more and more just how important and necessary it is that we find help for those in need. If you look at how much society has changed though, even in the last twenty years, it's no surprise that eating disorders are on the rise. Now with modern technology, we are bombarded with images and advertising on a daily basis; the diet industry can advertise their new "weight-loss secret" from all angles; and we're scrolling through social media where we now see more and more images of so called "perfection" and targeted advertising. It can almost feel like there's no escape from it. That's why it's so important to teach young women just how much goes into these photoshopped images, to reveal how the advertising industry works and to show them how not to play the comparison game. One of the main ideas in your book is that we are all, in essence, our worst enemies. Can you sum up how we can turn these voices around, into more positive ones? In my book I talk about my own inner Little Miss Critical. She lived with me throughout my teen years and she thought it was her job to tell me all the ways that I wasn't good enough and not perfect enough. She was so tough and so mean on me! I found healing and freedom when I actually made friends with my own inner Little Miss Critical, called her out for what she was doing in my life and told her to pack up her bags and leave. My inner Little Miss Critical was my own inner bully and we all have one. It's that voice inside your head that puts you down. It's so important to disarm that negative voice in your head by realizing that although Little Miss Critical might feel like she's a part of you, she doesn't have to control you. I tell girls to watch the language that they use when they speak about themselves. The language of Little Miss Critical is hurtful, mean, belittling and bullying. Flip that negative language to words of gratitude, positivity and encouragement. When you find yourself saying a negative or hurtful comment inwardly to yourself, do three things. Say "STOP! ", delete that thought and then flip it to something positive. You include inspiring quotes from women throughout the book. Who would you say is your role model in both improving yourself, and including young women to do the same? Aw, I love that you noticed the quotes! It was so important for me to include the words of inspirational women in my book because it's important for us to realize that as women, we're all on the same team, walking our individual paths collectively. I wouldn't be who I am if I didn't have other inspirational women to look up to. I have so many role models. I get goosebumps whenever I see a woman stand up and speak out about what she's passionate about. I'm inspired by women that find strength in their vulnerability and by women that aren't afraid to stand up for what they believe in (or feel the fear and do it anyway!). A few names spring to mind, from Emma Watson to Oprah, to Michelle Obama to Beyonce and JK Rowling! I also have to thank my mother for being my rock. We've had the natural push and pull that most mother/daughter relationships have but I would not be the woman I am today without her incredible support. And finally, what would you say to the person reading this if they are doubting their self-worth, perhaps due to not being happy with their appearance, or comparison to others around them/in the media? I would wrap my arms around them and tell them these words: You are enough exactly the way you are. At the core of your being you are perfect and your real power does not come from outside circumstances or from the way that society tells you you should look in order to fit in. No, your real power lies within you and when you release all those heavy and unnecessary critical thoughts and choose to fully love and accept yourself exactly as you are, that is when you will fully step into your true and authentic power and live a life of freedom and joy. Perfection doesn't exist. It's a lie that we're buying into as a society and this massively holds us back from being our best selves. Dieting will only wreak havoc on your body. Please do not harm or damage your body by trying to squeeze into a mould that is dictated to us by society. Instead, look at the incredible being reflected back at you in the mirror and give thanks for the amazing things your body allows you to do. If you would like to read the book for yourself, you can buy it here! Wow, this sounds like a book sorely needed by a lot of people. I think everyone, at some point in their life, has been at this point. Thank you for reviewing the book and also giving us a look at the author! Wow, lovely post. I would love to read this book as it is something I relate to.